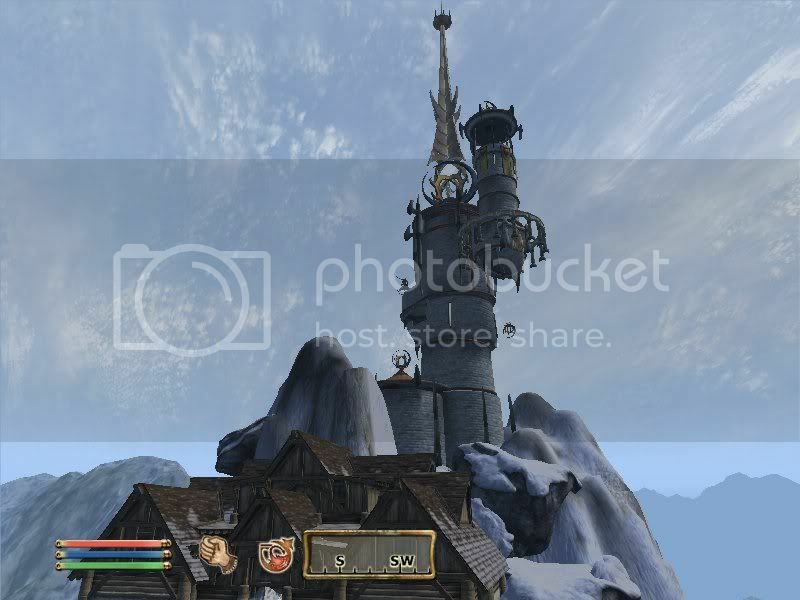 This is an archive of past Oblivion talk:Frostcrag Spire (place) discussions. Do not edit the contents of this page, except for maintenance such as updating links. 4 Secret Under the Vault Ice? 6 How do I make lots of money to upgrade? 7 How to rename Frostcrag Spire? 8 "Welcome home!" The hard way. 9 Using the Alchemy Lab. Why is Frostcrag Spire in "quests"? Shouldn't it be a location? Secret Under the Vault Ice? Has anyone noticed that there appears to be an underground tunnel under the ice in the vault? I tricky way of viewing this subterranean level is to cast fireball at the ground. As the fireball dissipates, you'll see through the floor for only a minute. I've heard from people that chests have fallen through the floor. I believe there must be some trick to melting the ice and accessing this lower level. If you look (I believe) in the direction of the iron girder, you'll see a tunnel entrance. If I was the owner of this place I'd say that it looks like the furniture guys put all the stuff down no matter what was there at the time. I lost a weapon or two under the table to the right of the conjuring altar that I'd stowed on the floor there. It was probably careless on my part and likely happened as soon as I bought all the upgrades from Aurelinwae. I'm new to the game and this forum so I ask: would it be in the spirit of this article to include mention of this possibility under "Notes"? -regards. How do I make lots of money to upgrade? I would suggest trying to duplicate items just go to main pages and go to glitches, or if your a honest player try doing the missions The collecter from Umbacano in the Imperial city, or just massacre everyone in the skooma den my yield of skooma was 38 it'll fetch you a nice 1.4k, and lastly of all try finishing Umbacano's missions you could get 2 item worth 8k/13k. How to rename Frostcrag Spire? This document is to inform the bearer that the last known owner of the property known as Frostcrag Spire has been declared deceased, and the bearer has been listed as the sole heir and successor to the deceased's ownership of said property. The bearer has full ownership rights to all of the structures, flora and land within the property borders as defined in the Cyrodiil Construction Charter. The bearer is responsible for all matters pertaining to or occurring on said property. This document also empowers the bearer transfer rights to reassign the property as he sees fit. The bearer may amend this document to rename the manor by submitting the proper forms and payments to the Cyrodiil Construction Charter and by filing duplicate forms with the Documents Division of the Imperial City Archives. Where & how to do that? "Welcome home!" The hard way. What the hell?! I just got assaulted in the main room of the spire! I was skilling up detect life in a controlled leveling attempt while I walked in and a hostile of a kind I have never seen before attacks from behind (Possibly a Dremora;It was humanoid in shape). I warp to the bedroom and it follows through the warp soon after. I escape to the Arcane University. I thought the spire was supposed to be secure! It could have possibly followed you in, and you somehow avoided it through the telepads. Only other possiblity is it just wandered in. I believe it is "The Conjurer" I was in the ground floor of the Spire when a conjurer came at me he summoned an Xivali. I killed him but didnt check the body (how stupid of me) and I still havn't been attacked by "the conjurer" unless that was him, at least I havn't killed a conjurer that had a spell tome I even went to fort Ceridian. Check out Triple damage potions. Silence for 24 seconds + Damage Health 7 points for 26 seconds, Fire Damage 8 points for 32 seconds, Frost Damage 8 points for 32 seconds, for a grand total of 694 points of damage over 30 seconds approx. Cast Invisibility 30 seconds, Sneak behind the final boss in any dungeon, and hit him once in the back, then cast Invisibility again and wait... he'll be dead meat within 5 or 10 seconds without realizing what's happening, between the Triple damage effect (694 damage not counting the dagger) and the 6 times sneak damage multiplier. According to the Potions page, the sneak multiplier does not apply to the potion induced 694 points of damage, so you could as well poison an arrow and sneak-shoot from a distance (3x) for the same result. PS that calculanus (or whatever it is) on the table of the alchamy lab is infact a master one its a shame you cant pick it up :(. It seems to me that if you kill the Atronachs that you summon from the altar in the summoning chamber (to soul trap), the corpses will not disappear. Has anyone else encountered this? Any known way to fix it without disturbing any of the other objects in the room? I had the same problem with a flame Atronach disappearing after I saved. Is this a bug in the system or something? I can't find it and I've searched the whole spire and the surrounding area but it's gone and it wont let me create a new one. Also The Atronach familiars of the frost and storm are much shorter. I performed the Frostcrag Spire glitch by standing in the Oblivion world plants section in the Living Area, saving, uninstalling F.S, then reloading. 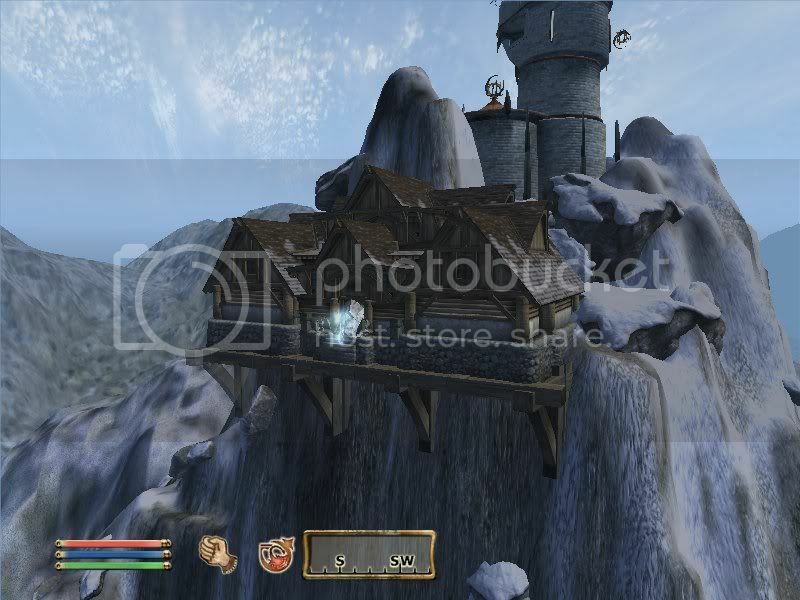 I ended up in the Bruma Test House. I went into the other test house that had the Sigil Stone. I saved the game on the main floor of the house, just in front of the "Door to the Wilderness". Didn't quite know where I was until I looked up. As hinted at by Krenn, you can sell the copies to make some of the money from the upgrade back, but yes, it's not so much a "library" as a "storeroom at a remaindered books shop." First you need to get the Deadric Lava Whiskey From one of the grave stones. Duplicate using Scrolls(or arrows if your game is un-patched). After Summon an enemy. Before the summons time runs out Drink four Duplicated Lava whiskeys, this will create four Dremora lords. When your player finally gets un paralyzed drink four more, and then drink four more again. you will have an army! Go to to the IC and wreak Havoc! (P.S you do not have to keep summoning a creature after you drink four whiskeys) Happy Killing! I've removed the VN from this after testing. To test, I stood on the spire portals and Fast-Traveled to Fort Farragut. I tried this three times and each time it took 15 mins. Traveling from the portals to the Temple of the Ancestor Moths took 45 mins (again, tested three times). I then used the console to lock (100) each of the portals and tried again three more times; this time it was an hour from the portals to both the fort and the temple. Traveling back from either to Frostcrag Spire took an hour no matter what. 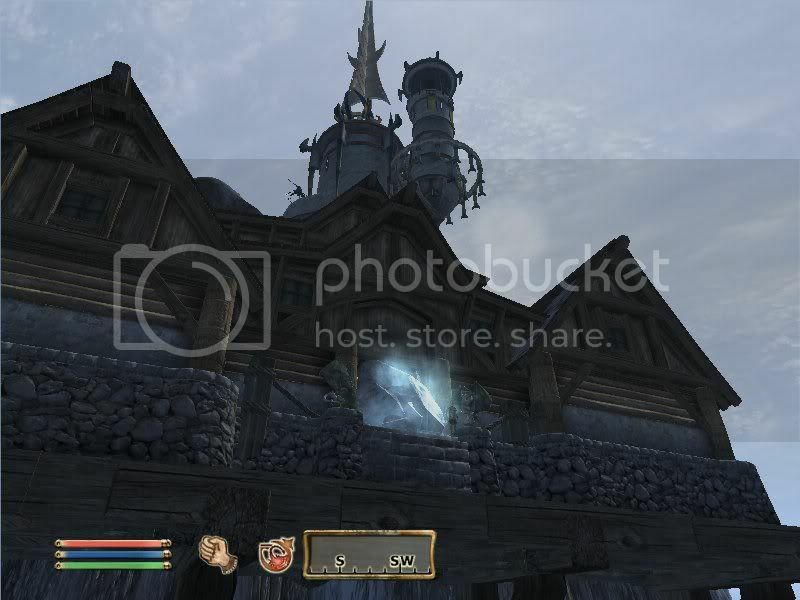 Its right by it, Im not sure if its another mod or what, I'm doubting it is sense I found the location code for it on a list of buildings that are in the official addons & oblivion game itself (Which I forgot sadly)But I have some images of it. Im not sure if a html code of the image is allowed so I'll put direct links to it. I found the answer to my own question after posting on the Bethesda Forums. do you possibly know if there is a way to clear all the atronach familiar bodies out of the spire lobby? Could someone please tell me how to get in Frostcrag becouse when i enter the wall doesnt open and i have the book and everything. For some reason the edit link is not appearing in the section headers. So to edit this page, the editor has to edit the whole instead of a section. I see the edit link in other pages, so I assume it is not just a problem with my browser. Can a patroler look at this and determine if it a really a problem or just something strange about my browser? Nothing too fancy...I just need to know if the crates are safe for storage. Since exploiting the Frostcrag Spire glitch, I wanted to move my Sigil Stones to their own containers, and immediately chose to leave them in the Vault area. However, I don't know if any of the containers there respawn, and I would like to know if any of them do before I go off and deposit my ill-gotten items in them.